As you can see from the picture above, a road sign in Chesterfield was set to display the message: “NAZI ZOMBIES! RUN!! !” over the weekend, which is either pretty funny, or a warning you’d end up wishing was in more places than just this one road sign. 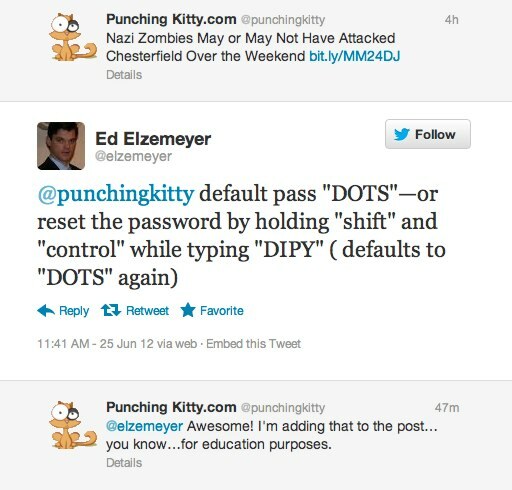 “Nazi Zombies! Run!! !” was programmed into a digital traffic sign at Clarkson and Kehrs Mill roads in Chesterfield over the weekend. Police said “Nazi Zombies! Run!! !” referred to video game _Call of Duty 5, World at War _that launched a “Nazi Zombies” game, and that went on to feature zombies of many nationalities. Good to hear the Chesterfield PD is up on their violent video game references. STLPD is just up on real life violence, so they probably don’t go home and play a game where they pretend to get killed over and over again. They’re so boring! The sign was changed from a construction message sometime between Friday 5pm and Saturday 7:15am, police said. There are no suspects in the case and police are calling it vandalism. The padlock was broken off, to get into the control panel and re-program the message. Typically, a sign computer is password protected. In our unscientific opinion, “typically” seems a bit strong for the actual percentage of road signs that are just using the default manufacturer-set passwords, but they did have to cut through a lock, so the cops are all over the case. Because, you know, this is a big deal. Sure, when “Seniors 2012 Rule” is spray-painted on a parking lot it’s just kids having fun, but here’s the difference: The 2012 Seniors may or may not rule, but either way we’re safe. A Nazi zombies attack however, while seemingly unlikely, could happen since all those real Nazis have been dead just about long enough to start thinking about coming back. Frankly if Zombie Hitler did come back and his plan wasn’t “Today Chesterfield, MO tomorrow, the world!” then he’s just not an effective strategist any more…or hasn’t eaten at the Chesterfield Mall’s Cheesecake Factory yet (it’s a good one!). …But. Probably. Won’t. But Maybe. Who. Knows. Just. Don’t. Ask. A. Scientist. Trust. Us. Nearby resident Rich Wieder said he saw the sign with his family, was confused momentarily, until his 15-year-old son told them about the zombie video game. “My wife and daughter both ran up to Kehrs Mill Road to take pictures. We got a good laugh out of it,” he said. Wait a minute! By taking this photo, are these supposedly upstanding citizens endorsing the “vandalism”?! Tell me it’s not so Patch writer Jean Whitney! Of course, none endorse the vandalism. Oh whew! So glad you added that Jean. Really important stuff there.